Lockout/Tagout exists to prevent unexpected start up of the equipment or energy to prevent injury to the employee while servicing. Lockout-tagout (LOTO) or lock and tag is a safety procedure which is used in industry and research settings to ensure that dangerous machines are properly shut off and not started up again prior to the completion of maintenance or servicing work. A disconnect switch, circuit breaker, manually operated valve, blind flange and any other device used to ensure that power or energy can not flow to a piece of machinery or equipment all come under this procedure. Energy sources including electrical, mechanical, hydraulic, pneumatic, chemical, thermal or other sources in machines and equipment can be hazardous to workers. During the servicing of machines and equipment, the unexpected start up or release of stored energy could cause injury to employees. 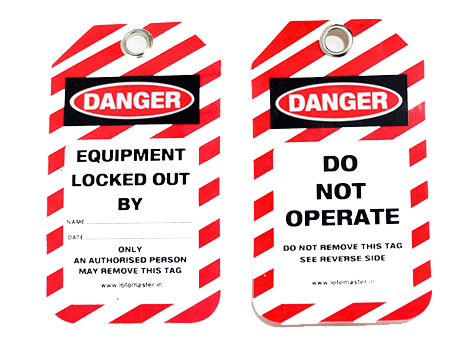 Proper Lockout/Tagout (LOTO) practices and procedures safeguard workers from the release of hazardous energy. The OSHA standard for The Control of Hazardous Energy(Lockout/Tagout) (29 CFR 1910.147) for general industry, outlines specific action and procedures for addressing and controlling hazardous energy during servicing and maintenance of machines and equipment. How can you protect employees? The Lockout/Tagout standard establishes the employer's responsibility to protect employees from hazardous energy in machines and equipment during service and maintenance. An initial review should be made to determine which switches, valves, or other energy isolating devices apply to the equipment being locked out since more than one energy source may be involved. When equipment is to be locked out, employers, supervisors and workers should always follow standard lockout procedures. What must employers do to protect their employees? Develop, implement and enforce an energy-control plan. Use lockout/tagout devices for equipment that can be locked out. Tagout devices may be used in place of a lockout device only if the tagout program provides employee protection equivalent to that provided through a lockout program. Ensure that the new or overhauled equipment is capable of being locked out. Develop, implement and ensure an effective tagout program if machinery or equipment are not capable of being locked out. Ensure that the lockout/tagout devices identify the individual users. Provide effective training as mandate for all employees covered by the standard. Comply with the additional energy control provisions under OSHA standards when machines or equipment must be tested or repositioned, when outside contractors work at the site, in group lockout situations, and during shift or personnel changes. Employees servicing or maintaining machinery and equipment may be exposed to serious physical harm or death, if hazardous energy is not controlled properly. Craft workers, machine operators, and laborers are among the workers who service equipment and are exposed to high risks. Compliance with the lockout/tagout standards prevents an estimated 60,000 injuries or fatalities each year. Authorized Employee - An employee who manually locks/tags machines or equipment in order to perform servicing or maintenance. Affected Employee - An affected employee is one, who is not qualified to lock/tag a piece of equipment which may need maintenance or servicing. An affected employee can also be a person who works in/around an area where the equipment may be locked/tagged out. Control of Hazardous Energy - OSHA's proper title for the lockout/tagout safety standard. The standard protects employees by requiring practices and procedures that prevent accidental machine start up for machines that are undergoing maintenance. Energy control program - A written procedure required by OSHA and developed by the employer that explains how to control hazardous energy in the workplace. Lockout Device - A device that uses positive means such as a lock and key or combination lock to hold an energy-isolating mechanism in a safe position and prevents equipment or machinery from being energized. Tagout Device - A prominent warning device, such as a tag that can be securely attached to an energy-isolating mechanism to alert employees that the equipment is not to be operated until the tag is removed.